Some people don’t quite “get” sport and that’s not a problem, but it is a shame when you consider the dedication and commitment the top athletes make to their craft, which result in hugely entertaining battles for their fans throughout the world. Indeed, it’s the top sporting arenas where many of us discover our heroes and inspiration; those who affect our lives for the better in more ways than any politician or employer could ever imagine. 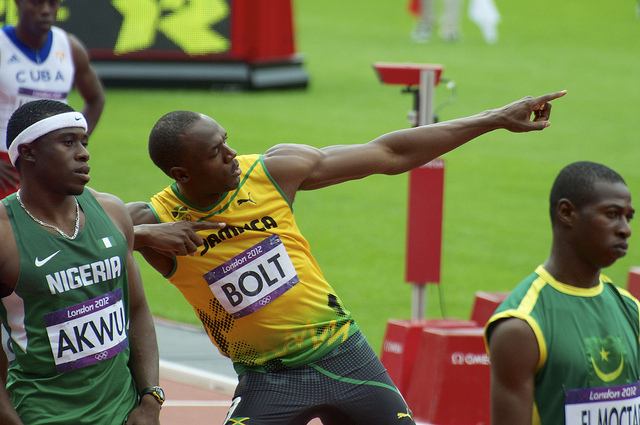 Since bursting onto the scene in New York, shattering the 100m world record, Usain Bolt has become one of the most decorated athletes of all time. The Jamaican’s confidence and unique personality have endeared him to sports fans around the globe, making sprinting a headline event once again. Winning a hat-trick of Olympic golds at three Olympic Games in succession will cement Bolt in the sporting Hall of Fame for eternity. With a total of 23 Grand Slam single titles, Serena Williams holds the record for the most Grand Slam wins by any tennis player in the Open Era. Serena, along with her sister, Venus, have helped to transform the world of women’s tennis, creating a new era of professionalism and athleticism that’s positioned it well and truly on par with the men’s game. According to Lottoland’s new infographic showcasing a list of inspirational athletes, Serena won her first Grand Slam at the tender age of 17. Her will to win and raw power has been an inspiration to many female sports stars in recent years. Regarded by many as the greatest tennis player of all time, Roger Federer has captured the hearts of tennis fans with his unmistakable swagger and style transcending across all court surfaces to win 19 Grand Slam singles titles at the time of writing. That’s the most in history for any male tennis player and even at the ripe age of 36, Federer was even able to prevail on the quintessential grass of Wimbledon in 2017; his eighth title at the All England Lawn Tennis Club. Not only is Federer a true tennis great, he’s a gentleman and equally gracious in victory and defeat. When it comes to dominating a sport, particularly an Olympic one, no-one comes close to the success swimmer Michael Phelps has enjoyed throughout the years. With 23 (yes, twenty-three!) gold medals – 14 more than anyone else that’s ever lived – Phelps is quite literally in a league of his own, smashing records in the butterfly, freestyle and medley with ease. Outside of the pool, Phelps’ own foundation now works hard to promote swimming and how to lead healthier lifestyles. Britain’s finest ever long-distance runner, Sir Mo Farah retired this year as the United Kingdom’s most successful track athlete in modern Olympic Games history. His success at the 2012 London Olympics captured the hearts and minds of Britons and sports enthusiasts worldwide, having moved to Britain from Somalia at the tender age of eight in 1991. One of sport’s genuine good guys, Farah was knighted for his services to athletics earlier this year. It’s not about the sporting successes of each of the athletes mentioned above, it’s the back-stories behind many of them, with the likes of Mo Farah and Serena Williams overcoming adversity and training in challenging conditions to reach the pinnacle of their profession.